Legendary Japanese rockers X Japan have announced a pair of shows to celebrate the 10th anniversary of their reunion in 2008. The bands will play the “Night Of Resurrection” shows at Tokyo’s 2500-capacity Zepp DiverCity in Tokyo on April 10 and 11. The shows come a decade on from the three sell-out shows the band played at Tokyo Dome after reforming in March 2008. Joining X Japan for the two shows are Limp Bizkit guitarist Wes Borland and Guns N’ Roses man Richard Fortus, both musicians who appeared with X Japan at the 2008 shows. The band will also be playing at the Coachella Music Festival in California on April 14 and 21. The shows will feature the return of X Japan mainman Yoshiki to the drumkit, 18 months after suffering a herniated disc in late 2016, and nearly a year on from undergoing emergency surgery on his back in May 2017. News of the reunion shows was posted on Yoshiki’s channel on the NicoNico streaming service site. 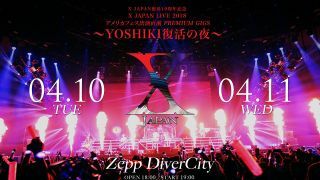 Tickets go on sale today via the fanclubs of each member of X Japan., with each ticket purchased including a commemorative souvenir. The shows will also be broadcast live to cinemas in Hong Kong, Korea and Taiwan. X Japan's Yoshiki: "I’m almost killing myself every show"